Quotes & references from Elizabeth Clare Prophet’s Climb the Highest Mountain: The Path of the Higher Self are made throughout this explanation. As the New Aquarian Age appears, the Purple (or violet) Transmuting Flame has been revealed to humanity. Our lower bodies—physical, etheric, emotional, and lower mental—must be purified before we can re-unite with our higher bodies. The electronic belt surrounding each individual, extending from the waist to beneath the feet, holds the accumulation of negative thoughts and feelings from this and eons of lifetimes. The electronic belt must be transmuted. Why? Spiritual energy is neutral … it magnifies whatever type energy it contacts. Thus, if we choose to bring in spiritual energy through meditation, yoga, and other means of focusing on the spiritual, while not at the same time seeking to purify and release all negative energy within our lower bodies, that negative energy is intensified. All energy seeks expression in whatever form is available. Negative energy, especially if made stronger by the influx of spiritual energy, will express as physical ailments and pronounced characteristics matching the negative energy. For example: Repressed anger will become more pronounced and emerge in all sorts of “quirky” ways. For this reason, holistic growth—physical, emotional, mental, and spiritual—is essential if we want to move forward on our spiritual journey. Failure to grow holistically renders us chained in place. Attempting to grow spiritually without transmuting our lower bodies. By contrast, making the decision to engage in holistic growth and to transmute all negative energies within our lower bodies renders spiritual growth a very exciting adventure. Holistic Growth allows us to move forward with great joy! During the 20th Century, Ascended Master Saint Germain revealed the Purple Transmuting Flame to us in preparation for the end of a World Age in 2012 and the evolvement into the New Aquarian (or Golden) Age. 1. Invoke the transmuting flame. 2. Do so with the express desire to be rid of all negativity – we must make the conscious choice to awaken spiritually and to be healed. Universal Law decrees our freewill cannot be violated. When we fail to make the conscious choice to awaken, we have in actuality chosen to remain asleep spiritually. 3. Open our consciousness to the Light and allow the vacuum to be filled with that Light. We must choose the Light over darkness/negativity. When we earnestly invoke the flame and open the floodgates of our consciousness to the Light, the negative energies that have been “imprisoned in matrices of imperfect thought and feeling are released.” The transmuting flame envelopes individually every atom of our being, dislodging the untransmuted densities from the electrons within our electronic belt. “As this substance is loosed, the electrons begin to spin more rapidly in their orbits; and by centrifugal force it is thrown into the violet flame. On contact with this fiery essence of freedom’s flame, the misqualified energy is transmuted into its native purity” and returned to the Causal Body where all our positive thoughts, feelings, and actions are recorded. This energy can then be used in loving service. Through the use of the transmuting flame—the spiritual fire—we can return to the Edenic state, we can ascend. We must win our freedom while on the Earth, because earth plane is where we lost our way, where we became imprisoned with imperfect thoughts and emotions. In order to participate in the mystic marriage-the reunion of our lower with our higher selves, we must purify our wedding garments. Remember that a part of the transmuting process is the opening of the floodgates of our consciousness for the influx of Light. Always allow the Light of God to fill the vacuum created by the removal of negative energy. We defeat ourselves when we invoke the flame, then cling to our negative thoughts and feelings. We cannot place our negativity upon the altar of purification, then take it up again, and expect to achieve transmutation. For most of the past 2,000 years of the Piscean Age, the true identity of Mary Magdalene has remained shrouded in secrecy. Why? What earth-shaking cataclysm is thereby postponed? Why is Mary Magdalene the only biblical character to be controversial? Why, in 591 C.E. (A.D.), did Pope Gregory I in his Homily 33 declare that Mary Magdalene and the woman caught in adultery (Luke 7) were one and the same; and that the faithful should regard Mary Magdalene as a penitent whore? In 1969, the Vatican officially repealed Pope Gregory I’s designation of Mary Magdalene as a whore and declared her a saint instead. However, the majority of the public continues to think of her as the prostitute. For many, Mary Magdalene’s identity has been confused by the presence of at least seven women called “Mary” in the gospel stories. At least one major Hollywood movie presented Mary Magdalene as Mary, the sister of Lazarus. Can we solve the mystery—who is Mary Magdalene? Harper’s Bible Dictionary lists the seven Marys. 1. Mary, the mother of Jesus – Roman Catholics venerate this Mary as the Virgin Mother of the God Child, Jesus. Yet, aside from the virgin birth stories in synoptic gospels of Matthew and Luke, Mary—the mother of Jesus—is portrayed as not truly understanding her son’s mission. The Gospel of John differs in many ways from the synoptic gospels. Although Jesus’ birth is not mentioned in the Gospel of John, Mary appears to be familiar with the spiritual power residing within Jesus—as depicted in the story of the wedding in Cana. But is this Mary, the mother of Jesus – or – is it Mary Magdalene? Has the text been manipulated so that it appears to be the wedding of an unnamed couple in Cana to which Jesus had been invited? Let’s look at the narrative in John 2:1-11. 1) Mary takes charge when the wine runs out, even though as an invited guest she would be acting inappropriately. 2) No mention is made of the bride. 3) The chief guest calls the bridegroom to commend him on the wine. Was this Jesus? 4) Mary and Jesus were responsible for the wine … why? Jewish custom was that the wedding feast took place in the home of the groom’s father. Here is where the wine flowed freely and the celebration lasted for a week. By the time Jesus began his ministry, his earthly father had died. According to the Talmud, Joseph of Arimathea was the younger brother of the father of Mary, mother of Jesus. As Mary’s uncle, Joseph of Arimathea became their legal guardian. Joseph of Arimathea was one of the wealthiest men in the world, with vast holdings in the tin mines of Britain and one of the largest private merchant shipping fleets afloat. Since the village of Cana is located between Magdala—a thriving community for shipbuilding and pickled fish that were shipped throughout the Roman Empire—and Phoenicia, also known for its shipbuilding industry, could Joseph of Arimathea have owned a residence in Cana? History and traditional legends report Jesus spending much time in the company of his uncle during the “lost years” of the New Testament record. Could the wedding feast have taken place in Joseph’s residence in Cana? Connecting all the dots certainly makes it a possibility—a possibility that could even explain why Mary and Jesus took charge when the wine gave out. 2. Mary of Bethany, the sister of Martha and Lazarus – Mary Magdalene is frequently confused with Mary of Bethany. This confusion is based partially on the three differing stories of a woman anointing Jesus. In the Gospel of John, Mary of Bethany is depicted as the “Mary” who anoints Jesus’ feet with expensive perfume and wipes them with her hair. “Mary took a cruse containing pure and expensive nard, and anointed the feet of Jesus, and wiped his feet with her hair; and the house was filled with the fragrance of the perfume.” Mary of Bethany anointing her Master’s feet is a sign of Middle Eastern hospitality and of her obeisance to him as one of his disciples. (John 11:1-2 from Lamsa’s ancient Aramaic text) The fact that she used very expensive pure nard reveals Jesus’ friends in Bethany were also wealthy. As we shall see later, the Gospel of Mark’s version is striking in its differences. According to some biblical scholars, there is no reason to think the anointing event was limited to only one occasion. Due to the hot, dry climate, it was Middle Eastern custom to anoint oneself/guests with aromatic oils. It is possible the gospels reflect written or oral accounts of more than one anointing. Both Luke’s and John’s versions appear to occur early in Jesus’ ministry. Mark’s version takes place at the end of Jesus’ ministry. Another reason Mary Magdalene is confused with Mary of Bethany is that Jesus considered the three siblings—Martha, Mary, & Lazarus—close friends whom he visited frequently. However, Mary of Bethany’s personality is the opposite of Mary Magdalene’s. Mary of Bethany is most often mentioned as being in the company of Martha and Lazarus in or near her home in Bethany. She is the passive, mystical member of the family who appears to lack practicality. Martha is definitely the head of the household. Mary of Bethany views Jesus as her teacher; she sits at his feet while he speaks in her home—oblivious to the food preparations occupying Martha’s attention. Mary of Bethany was not active within the ministry of Jesus. He saw her only when he visited Bethany, a Judean village on the eastern slope of the Mount of Olives about two miles east of Jerusalem and approximately two weeks journey by foot from Nazareth—Jesus’ hometown and Capernaum—where Jesus’ ministry was based in Galilee. The map at the bottom of blog reveals the distance from Magdala, near Capernaum on the west side of the Sea of Galilee in Galilee, and Bethany, located just outside Jerusalem near the Dead Sea in Judea. Samaria is located between Galilee and Judea—most Jews would not enter Samaria during the time of Jesus. Almost the entirety of Palestine separated the hometowns of Mary of Bethany and Mary of Magdala. To confuse their identities defies logic. 3. Mary, the mother of James, Joseph, and Salome – or – the “other Mary” as she is called in the crucifixion and burial scenes. 4. Mary, the wife of Clopas and sister-in-law to Mary, mother of Jesus. Some accounts list her as the sister of Mary, mother of Jesus. This Mary was also present at the cross. She is often confused with Mary, the mother of James, Joseph, and Salome. In Matthew 10:3, “James,” the lesser disciple, is listed as the son of Alphaeus (also called Clopas and Cleopas) and thus, the son of this Mary and cousin to Jesus. 5. Mary of Jerusalem in whose spacious home Jesus and his disciples celebrated their last Passover together and where 120 (not counting women) of Jesus’ followers met after his death. (Acts 1:13-15) Mary of Jerusalem’s son, John Mark, accompanied Barnabas and Paul on some of their missionary journeys. 7. Mary Magdalene or Mary of Magdala, whose name appears first in every listing of Jesus’ female disciples. (Mark 15:40-41, 47; Mark 16:1; Matthew 27:55-56, 61; Matthew 28:1; Luke 8:2-3; and Luke 24:10) Biblical scholars therefore believe Mary Magdalene to have been the leader of a group of women who traveled with and served Jesus throughout his three years ministry. Mary Magdalene was ever-present with Jesus in all four gospel narratives. 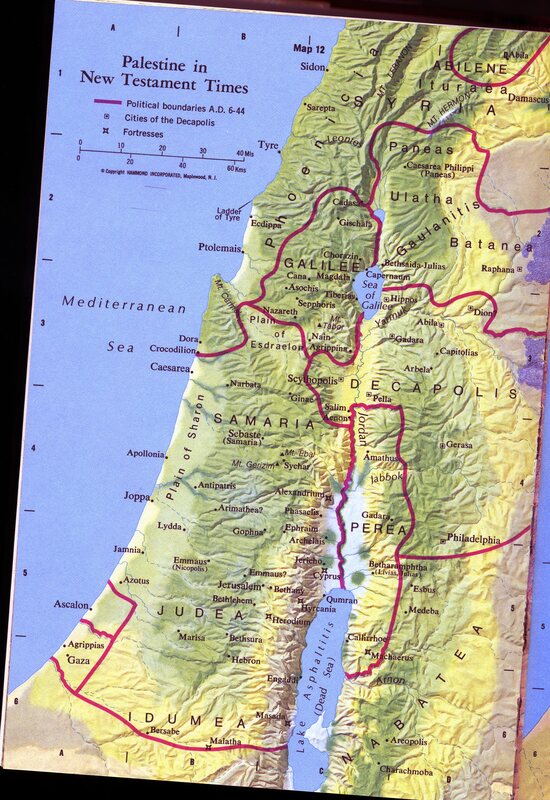 The majority of Jesus’ ministry took place in Galilee, along the western shores of the Sea of Galilee. “He did not wish to travel in Judea because the Jews wanted to kill him.” (John 7:1) His ministry was centered in Capernaum, where he taught in the synagogue and frequently stayed in the home of Peter. 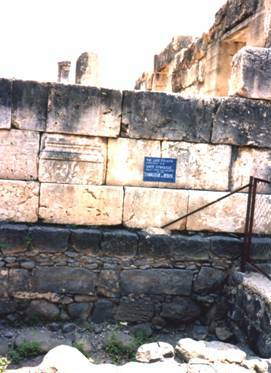 Archaeological remains of both the synagogue and Peter’s house are visible today. The still vividly painted ceramic tile floors of Peter’s home are confirmation of his wife’s wealth. 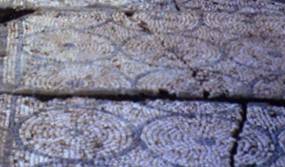 Ceramic tile floor in Peter’s house in Capernaum – a long brick, waist-high fireplace is located to the right. This room is thought to be the cooking area. Note the size of the home. Ceramic tile floors are found only in the ruins of wealthy homes. 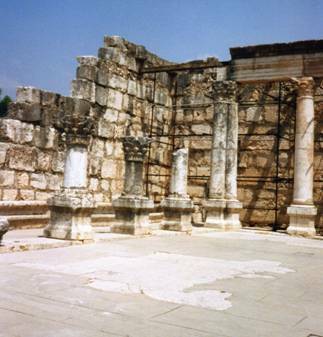 Synagogue at Capernaum – the black stones belong to the synagogue know by Jesus, the white stones are the synagogue built over the one in which Jesus taught. 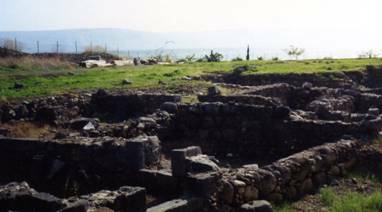 Synagogue at Capernaum – built over the one Jesus knew. Ancient traditional legends state Peter’s wife’s name as Petronilla, a beautiful, well-bred, wealthy woman who assisted Peter throughout his ministry. She and Peter were martyred together in Rome. The main route of an international highway known as the Via Maris was located along the western coast of the Sea of Galilee. Capernaum and Magdala—located on this route—prospered by the international fish trade. The Sea of Galilee contained some forty species of fish that were salted in Magdala and shipped throughout the Roman Empire. According to the Jewish Virtual Library, Via Maris was one of the most important trade routes in the Middle East during ancient times. Via Maris is Latin for “Way of the Sea” referred to in Isaiah 9:1. The map above reveals the three major trade routes in ancient Palestine: Via Maris, Ridge Route, and the King’s Highway. The Via Maris “connected the major routes from the Fertile Crescent to Mesopotamia (from Egypt to modern day Iran, Iraq, Turkey, and Syria.” Ancient Palestine was cosmopolitan; its territory was alive with international trade and exposure to numerous cultures. Biblical characters spoke several languages, including Hebrew, Greek, and Aramaic. Studying the geography of ancient Palestine requires that we re-think our concept of who the biblical characters were. Those characters that we study by name were not poor, naïve, and uneducated. Instead, they were wealthy, educated, and well-traveled. According to traditional legends, Mary Magdalene met Jesus in the home of Peter. At the time they met, Mary Magdalene is described as being young, beautiful, arrogant, gorgeously attired, worldly, and very wealthy. When she stepped into his presence, she was so impressed that she immediately renounced her former life in order to follow Jesus. 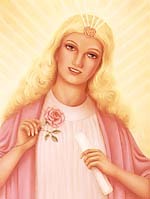 This transformation from a life focused on the emotional and materialistic planes to a life completely dedicated to serving the Christ denotes the healing mentioned in Luke 8:2: “Mary who is called Magdala, from whom seven demons went out ….” Charles Fillmore, founder of the Unity Movement, interprets demons to be error thoughts and feelings. Mary Magdalene was not possessed. She lists the seven powers of wrath or demons in her The Gospel of Mary. They are: “darkness, desire, ignorance, excitement (likely meaning fear) of death, kingdom of the flesh, foolish wisdom of the flesh, and wrathful wisdom.” Another translation of The Gospel of Mary lists these demons or manifestations as: darkness, craving, ignorance, lethal jealousy, enslavement to the body, intoxicated wisdom, and guileful wisdom. These demons are the same demons each of us must overcome in order to achieve a higher, 5th dimensional consciousness—no negativity or non-truth can more forward into the higher dimensions. The description of young Mary Magdalene by the traditional legends could describe any number of super stars in our 21st century American culture—super stars whom many attempt to emulate. In modern language, Mary Magdalene was a super star who was transformed into a servant of the Christ and thereafter used her wealth to support Jesus’ ministry. As related in John 8:1-11, the woman caught in adultery was brought to Jesus while he taught in the Temple of Jerusalem. By this time, Mary Magdalene was an established and integral part of Jesus’ ministry. Even if this were not the case, Mary Magdalene lived in Magdala, a town located approximately two weeks foot-journey from Jerusalem. Even though her family was wealthy, the possibility of a young Jewish woman from Magdala being free to roam alone in the metropolitan city of Jerusalem appears remote. Ancient tradition places her first meeting with Jesus as being in Peter’s home in Capernaum, not in the Temple of Jerusalem. It seems far more likely that Mary Magdalene’s family were friends with Peter and Petronilla’s family. Both were wealthy and would have associated in the same economic/social circles. The outskirts of the villages located around the Sea of Galilee were very close to each other, enabling easily accessible interaction between their residents. From her life of materialism, Mary Magdalene became the most spiritually advanced of Jesus’ disciples—an Initiate into the hidden wisdom to which Jesus so often referred. She pre-empts Peter and John when she receives revelations from the risen Christ that she is to share with the disciples gathered at the home of Mary of Jerusalem. The Gospel of Mary reiterates this favored position. Throughout the four gospel narratives, we see Mary Magdalene and a group of wealthy women traveling with Jesus. They financially supported his ministry, as well as served alongside of him and the other disciples. Joanna, the wife of Herod Antipas’ steward, Chuza, and Susanna are also listed as belonging to this wealthy group of women. (Luke 8:3) Some of the women traveling with Jesus were either the wives or family members of Jesus’ disciples—Peter’s wife Petronilla; Philip’s wife and daughter; Mary, wife of Clopas and mother of the lesser James. For the duration of his ministry, Jesus was surrounded by his wealthy female disciples. His attitude and treatment of them had no resemblance to the traditional attitudes toward women that were prevalent in the Middle Eastern culture during biblical times. They were his equals and he recognized them as such. How and why has Mary Magdalene been confused with Mary of Bethany? From the biblical account alone, we see Mary Magdalene stood out as a respected leader of Jesus’ female disciples, many of whom were likewise wealthy and would have been accustomed to demanding the respect afforded an individual of high status in Galilee. Yet, they willingly accepted Mary Magdalene’s leadership. Mary Magdalene possessed the “eyes to see and the ears to hear”—a phrase Jesus used to denote those who could understand the hidden meaning of his teachings—the spiritually awakened. Mary Magdalene understood the mission of Jesus. In contrast, Mary of Bethany led a sheltered life in the home of her siblings, Martha and Lazarus. Mary Magdalene is assertive with a strong sense of individual identity evidenced in her leadership role; Mary of Bethany, though loving the teachings of Jesus, is passive and submits to the leadership of her sister, Martha. She sits at Jesus feet to listen to his teachings, while Mary Magdalene walked beside him throughout his ministry. To confuse the two women defies reason. The answer as to why confuse them is a matter of far greater import. The discovery in 1945 of the Nag Hammadi Library consisting of 4th century manuscripts can shed light on this confusion. The Gospel of Philip identifies Mary Magdalene as “the one who was called his companion,” meaning Jesus’ companion. “And the companion of the … Mary Magdalene. Loved her more than [all] the disciples and [used to] kiss her [often] on her […] The rest of [the disciples]. They said to him, ‘Why do you love her more than all of us?’ The savior answered and said to them, ‘Why do I not love you like her? When a blind man and one who sees are both together in darkness, they are no different from one another. When the light comes, then he who sees will see the light, and he who is blind will remain in darkness.’”  According to ancient traditions, Jesus and Mary Magdalene had three children: a daughter named Sara and two sons. Since Joseph of Arimathea was legal guardian for Jesus, he would have been the one to meet with the father of a perspective wife. The very likely connection between Joseph of Arimathea and the wealthy families living in a major shipbuilding community like Magdala enhances the likelihood of marriage between Mary Magdalene and Jesus. Marriage was for the purpose of having children and continuing the family lineage and DNA. The relationship between Mary Magdalene and Jesus is that of Twin Flames—two parts of the same Soul. The symbolic story of Twin Flames is found in Genesis 2. “And Adam gave names to all cattle, and to all fowls of the air, and to all wild beasts; but for Adam there was not found a helper who was equal to him. So the Lord God caused a deep sleep to fall upon Adam, and he slept; and he took one of his ribs, and closed up the place with flesh in its stead. And of the rib which the Lord God had taken from Adam he made a woman, and brought her to Adam. And Adam said, ‘This is now bone of my bones, and flesh of my flesh; she shall be called Woman, because she was taken out of Man. Therefore shall a man leave his father and his mother, and shall cleave unto his wife, and they shall be one flesh. And they were both naked, Adam and his wife, and were not ashamed.” To be naked is symbolic of being pure, open. According to the Ascended Masters’ teachings, twin flames are two parts of the same Soul. Although twin flames may experience a few lifetimes together, they tend to go their separate ways until they are ready to be reunited, to leave the wheel of karma, and to prepare for ascension into higher dimensional living. In order to prepare for ascension, twin flames must accomplish a mission together. This does not mean the twin flames will be on the same dimension while engaged in the mission; however, they will most likely be consciously aware of working together. Twin Flames are never truly separated because as one grows—or fails to grow—he/she impacts the other. Even though Twin Flames are in vastly different sections of the cosmos, the soul link is ever-present and they will eventually be ready to reunite on the same plane. When she first met him at Peter’s home in Capernaum, Mary Magdalene instantly recognized Jesus as her twin flame and transformed her lifestyle in order to complete their mission together. She accompanied and assisted Jesus throughout his ministry, then continued, as the Apostle of Apostles, to teach the disciples the hidden wisdom Jesus had taught her privately. 1. The woman is wealthy. She uses very expensive pure nard (spikenard), a perfume imported from the Himalayas in alabaster boxes and opened on special occasions. In biblical times, this nard cost approximately one year’s wages. (Harper’s Bible Dictionary). 2. Anointing on the head, during biblical times, was a means of investing someone with power, such as the anointing of Solomon as king by the priest Zadok and the prophet Nathan. (I Kings 1:39) Anointing could also signify the consecration of someone or something for a holy purpose. Anointing on the head in the presence of a gathering was performed by priests and prophets—persons held in high esteem and possessing spiritual authority. 4. The story of the woman anointing his head is to be told as a memorial to her, not to Jesus. Jesus knew her actions to be on par with his gospel. This eternal union instituted by Jesus signifies a pairing of male and female. Mary Magdalene and Jesus were Twin Flames performing their mission together. Even though the time of being physically together was drawing to a close, this joint mission continued as Mary Magdalene became the Apostle of Apostles. Map of major trade routes running through Palestine – Taken from the Jewish Virtual Library Website. Preface to The Gospel of Mary, David Tresemer, Ph.D. & Laura-Lea Cannon. The two extant copies of this gospel are a part of The Nag Hammadi Library. Harper’s Encyclopedia of Bible Life, Madeline S. & J. Lane Miller. The Drama of the Lost Disciples, George F. Jowett. Harper’s Bible Dictionary, Paul J. Achtemeier, General Editor. New Age Bible Interpretation, Corrine Heline. Metaphysical Bible Dictionary, Charles Fillmore. The Gospel of Mary Introduction, Karen L. King. The Gospel of Philip, Nag Hammadi Library. Harper’s Encyclopedia of Bible Life, pages 98-100. Lord Maha Chohan, July 1956: “URANUS is a very large planet and there are a tremendous number of lifestreams evolving upon it. The people on this large planet of Uranus are beyond disease, death, or decay. The vibratory action is much more rapid than it is upon the Earth [the reason our telescopes see incorrectly]. The people are of larger statue; they are seven to eight feet tall, golden haired and blue-eyed. Strength, vitality, and power are the predominant qualities. The people of Uranus are those described as belonging to the time of the Amazons, when the beautiful ladies of the golden hair dwelt on Earth. Most of them came from Uranus and many of them have during their repetition of earth life taken on smaller bodies through mercy and wisdom of the Cosmic Law, in order to be less conspicuous…. On Uranus, the center of the entire planetary scheme is built on the spiritual priesthood, which is fully acknowledged and which governs not only the main continent where the main Temple is located, but also the other continents on that planet. The people there recognize absolutely the Divine Sovereignty of this Cosmic priesthood. The people of Uranus are very large in proportion and very beautiful. A three year old child stands as high as four and a half feet. They are trained from childhood in the Rites of Invocation, and Radiation; in the powers of levitation, precipitation, and etherealization. The Ascended Masters and Cosmic Beings walk and talk with them as you walk and talk with each other. There is no veil, no maya [illusion], no human creation around the planet and it is a most marvelous thing to see what an evolution can accomplish when there are not those rip tides of psychic energy, nothing to hinder the expansion of the Immortal Flame within the heart fulfilling the Divine Plan and Pattern. Their buildings are colossal. Having the power of levitation, there is no need for mechanical machinery. Everything is done by mindforce; the coloring is done by feeling. Their atmosphere is perfect. The moisture does not come in rainfall, but by a coarse substance that comes through what is similar to your earth. The body structure itself of Uranus is a beautiful green instead of brown. The moisture comes through the porous substance, fills their lakes, rivers, and cisterns, and fills the atmosphere with the necessary moisture. The water is aquamarine; the landed surface is a darker green; the verdure and growth variegated in color. That is determined mostly by the Aura of the individuals who represent the unit of people residing in certain localities. The continental Devas affect the entire contour and over-all color of the various continents. The great planetary Silent Watcher governs and controls the entire Uranium Aura in the atmosphere. When a citizen decides to create a temple or a lovely home, he uses mindforce. He directs his attention to the God-self or perhaps to some Master who is developed in the art of architecture. Then through mindforce he cuts his design and builds. Buildings are mostly open to the sky, some have canopies for beauty’s sake but not for protection form the elements, because there is no need for it. When it comes to the great Temple work the priesthood alone works on that. The priesthood draws from the Universal First Cause the design and pattern. When these patterns have been received by the priesthood they are then imparted to the ones that will participate in the building, in the same manner as Sanat Kumara imparts the Thought-form of the year to the Hierarchy. Then the Temples are built. The one designated to do the coloring will draw on the Flame in his heart until he gets a concentrate of that particular color of blue energy, for instance, in, through, and around him, and then just like one puts point on with a brush, that blue energy flows out from him and just covers over that portion of the column, fresco, ceiling, or floor that is to be blue. So each color is put on, they do all that through feeling. They can do it very quickly or they can take time, as you know it, according to their desire. Sometimes they create a family home that will last for hundreds of years. The music on Uranus is strong, powerful, and vibrant, similar to “The Marseillaise” and all those songs like “Pomp & Circumstance” that represent faith and triumph. Their activities are particularly concerned with the New Age…. Much has been said about the Aquarian Age. This is because Uranus will enter into the Aquarian orbit; then the Earth entering the Uranium orbit, will in the next Cosmic wave go into the Aquarian orbit. There are people here [on Earth] from Uranus, Mercury, and Venus as well as those who belong to the Earth. Each one brings some memory of his planet and evolution. Facts about other planets have come through individuals who came from these planets. Maha Chohan, August 1955 – “The vibratory action of the planet AQUARIA is much more rapid than on Uranus since it is closer to the Sun. The evolution of its people is much more quickly accomplished. When Mercury has entered within the Electronic Belt of the Sun, Aquaria will be the closest to the Sun. Aquaria is a smaller planet than Uranus and looking at it from Cosmic space, it presents a beautiful blue color, something like aquamarine, its color being a combination of the aquamarine and turquoise that is seen in the most perfect jewels. Everything about it, even its verdure, flowers, and its nature kingdoms are all on the Seraphic lines of the most delicate and refined stature. The people are very delicately fashioned as well, their hands, the contour of their faces, their bodies and forms are all very slim. They have long slender feet and golden hair like those on Uranus. 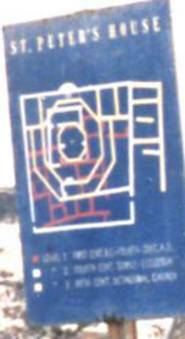 The fine, delicate line of feature and design of person, home, and Temple are very evident. The Aquarians have accomplished mastery of the Immortal Three-fold Flame within their hearts until It is visible so that the people of Aquaria are luminous from the waist upward and the Light blazes forth. Everyone wears a natural crown of Light made up of the seven Rays of the Elohim. Their jewels are precipitated fire, and all is done with delicacy and great finesse. Their garments are mostly in the Grecian style, both men and women. Their children are very fair and look almost like fairies as known on the Earth. Their footfall is so light, because of the self-luminosity of the body, that when they move they do not even make an imprint upon the beautiful surface of the land where there grows a sort of an aquamarine colored ground covering, similar to your grass. There are beautiful mountains in variegated colors. Some of you have seen the mountain tops pink, gold, and violet, but these mountains on Aquaria are beautiful colors all over from top to bottom. Because these people levitate as easily as the Masters, there are lovely golden pagodas and llamassaries way up in the very high places, which would seem almost inaccessible from the human standpoint. There is great symmetry and a great pattern in all activities of nature. There are seven continents on Aquaria. There are seven continents on all the planets belonging to Helios and Vesta. In the system above, the one in which Alpha and Omega belong, there were 12 continents on every planet. There is delicate and beautiful music on Aquaria, rising to the Sun. Since the individuals are self-luminous and the atmosphere has no discord, the Music of the Spheres is easily heard by all the people. The inhabitants pass through a 14,000 year cycle from the time the soul is born until it receives its Ascension. Some live to 1,000 to 1,200 years. So-called death is unknown, and at the end of a life span since there is no disintegration or decay, the individual merely steps within a concentrate of the Fire of Etherealization which is focused in a Temple in the locality where he lives. There are Temples which are like your crematories, not only every continent but every locality has such a Temple which they call “Completion.” When the individual has completed a lifespan, he proceeds to that Temple, his family invariably accompanying him and to beautiful music and ceremony, he steps within the Flame and just disappears into the Light, consciously entering into the inner Realm where he forswears [to reject or renounce under oath] his body for the time being. He often comes back and re-assumes his contact with the various members of his family. Because of the long period of life there, even if he is out of embodiment for 200 to 300 years, most of his loved ones are still around and wait for him to return. Birth on Aquaria is through the projection of the Light Rays from the chosen parents. If the individual does not care to go through a period of young childhood, he is already in full command of his faculties. He comes in wearing a very light garment which could not be called a fresh garment but is equivalent to that in the realm in which he abides. Often, he will take on the studies in which he was proficient before he went out, arrangements being made with his family and friends before he enters the Temple of Completion, to put his books and experiments all together, usually into a lovely golden chest marked with his name and the approximate date of his return. This continuity of consciousness makes things very much easier for the individual who lives on Aquaria. When he is reborn, there is a ceremony again in a Temple which they call the Temple of Opportunity. There the parents go, accompanied by family, friends, and loved ones. As the parents direct the Light Rays, it forms the vortex of the heart of the incoming individual, into which the Presence of that one descends. There is no veil, the Presence descends into a Flame similar to that which causes etherealization, then the parents coalesce around that Flame an outer vehicle. It is only a matter of ten minutes or so until the child steps out of the Flame. He usually greets the parents with a handclasp or an acknowledgment, greets his friends, and has a period of adjustment again to the planet. He can then go and re-possess his treasures and continue with his experiments and activities of Light. This planet is very, very beautiful and the lifestreams from it that have come to Earth can be distinquished easily by the very delicacy of their form. They will always be individuals who are very slender, rather ethereal and they carry a great buoyancy and sensitivity of spirit. The Mercurians are an entirely different type of lifestream. They are tremendously charged with fire and are a very positive people. 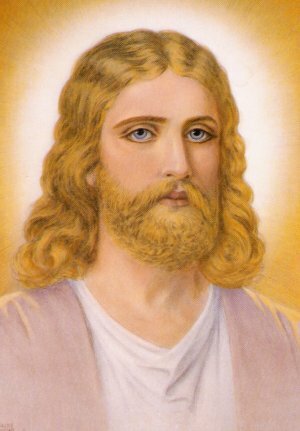 Thinking upon the nature of beloved Ascended Master Morya, Who is a Mercurian, one can understand this. So, the adjustment of the Aquarians to take the orbit of the fire people of Mercury is also quite an initiation. Many Mercurians are living on Aquaria, assisting to this end. With Comments by Nancy B. Detweiler, M.Ed., M.Div. COMMENT: We function on a combination of Rays. The two major Rays upon which you are functioning will be connected to your Sun Sign and to the Ascendant within your Astrological Natal Chart. The only way to determine the Ascendant is to have a computer print-out of your natal chart. Since the Sun represents your Soul in esoteric astrology, you can learn the overall intent of your Soul by knowing its Ray. However, it is important to remember that the natal chart is an extremely detailed map of your Soul’s purposes for incarnating into a physical body. Learning about one or two Rays on which you are functioning is simply a beginning. There is always much more to learn! I offer this brief information to assist you in “Know Thyself” – a major task in preparing for ascension into higher consciousness. Understanding your family members as unique human beings with specific soul intentions is also helpful. If your Sun Sign or Ascendant is Aries, Leo, or Capricorn, you are functioning on the FIRST RAY OF WILL/POWER. “The energy of the First Ray acts as a catalyst, breaking up old existing conditions so that new ones may eventuate. Soul Level: The use of spiritual will for the benefit of the collective; power utilized for the purpose of enhancing unity and beauty; the expression of will for the purposes and well-being of the group. Personality Level: Ray of soldier, statesman, ruler, explorer, leader, government, politics, and administration. General positive Traits: Courage, diligence, quick discernment, leadership abilities , inspires others, adventurous, not dismayed by initial failures, but remains persistent until goal is achieved. General Character Difficulties: Limitless ambition, uses will for selfish purposes, manipulative of others through personal power, easy to anger, cannot take criticism, strong sense of personal pride. If your Sun Sign or Ascendant is Gemini, Virgo, or Pisces, you are functioning on the SECOND RAY OF LOVE/WISDOM. “The Second Ray is called the Master Builder…. It represents the cohesive force in the universe…. The Second Ray is the energy behind what we call “universal love” … connected to the powers of intuition…. The Second Ray instills cooperation between people, philanthropy, and the urge to serve. Soul Level: The urge to bring about a sustaining, loving wholeness to any group or life situation; the ability—through magnetic attraction—to bring about healing; the focus for the stimulation of consciousness, and hence for greater love/wisdom; the ability to see beyond differences into unifying principles. Personality Level: Ray of teachers, people in the healing and service professions. General Positive Traits: Naturally sympathetic and compassionate; eager to be of assistance; generous and philanthropic; calm, strong, and patient when dealing with the daily situations of life; faithful and reliable; lovers of truth who are very intuitive by nature. General Character Difficulties: Coldness, if Wisdom aspect is overemphasized; indifference to others; misplaced affection—always feeling sorry for things; a negative, ‘Why is it always happening to me’ outlook to life; rarely satisfied with personal accomplishments. If your Sun Sign or Ascendant is Cancer, Libra, or Capricorn, you are functioning on the THIRD RAY OF ACTIVE INTELLIGENCE. “The energy of the Third Ray … permeates into every form of life. The Third is the Active Intelligence of Divinity, and represents the inherent intelligence within all matter…. All of humanity is strongly governed by the Third Ray…. The Ray of activity. People who are closely connected to the Third Ray are very much on the go. Soul Level: The birthing of ideas to benefit humanity; the structuring of time and activities to allow for group energies to flourish; inherent, objective intelligence ready to be used in service to humanity in all ways. Personality Level: Ray of the astrologer, scholar, judge, banker, economist, chess master, abstract thinker. General Positive Traits: Adaptability, clear intellect, articulate speech, and ease in communicating ideas; business skills; ability to plan in advance in logical ways; a fine capacity not to worry oneself or others about insignificant matters. General Character Difficulties: The tendency to be overly active and nervous; too much pride in one’s intellectual capabilities; selfishness through a sense of isolation; the manipulation of others, especially in terms of the use of other people’s resources; mind games; overly strong attachment to materialism. If your Sun Sign or Ascendant is Taurus, Scorpio, or Sagittarius, you are functioning on the FOURTH RAY OF HARMONY THROUGH CONFLICT. “The purpose of the Fourth Ray [is to be] an agent of balance. The Fourth Ray leads to that type of discrimination required for the life of the Soul and the way of service. It is thus the Ray of trial and error, so that we may move from the unreal to the real. The Fourth Ray is the energy behind what we may call ‘Divine Discontent’…. As the Ray of beauty and art, the Fourth Ray is also essentially the refiner—the urge for an ever-more-perfect representation of the Will of God in the many forms of Its expression…. The Fourth is the Ray of struggle, and those people who are especially connected to it will find a very special duality appearing in their lives…. As the Ray of the artist, the Fourth is especially connected to color. People who are closely associated with this Ray may find themselves with tremendous gifts. Soul Level: The ‘Divine Artist’—one who seeks to raise humanity’s consciousness through the realization of the beauty and harmony existing in nature and in the world of forms; the mediator between heaven and earth, God and man; the Priest. Personality Level: Ray of the mediator, interpreter, artist, and those healers whose treatments involve the harmonizing and balancing of the body’s energies and polarities—acupuncture, certain techniques of massage, color therapy. General Positive Traits: Strong sense of equilibrium and symmetry; a poetic sensibility, especially about nature; imaginative and creative in the formation of one’s life-style; can sustain struggle and conflict until desired aims are achieved. To Be Cultivated: Serenity, emotional balance, confidence, self-control, truth, clarity of purpose. If your Sun Sign or Ascendant is Leo, Sagittarius, or Aquarius, you are functioning on the FIFTH RAY OF CONCRETE KNOWLEDGE. “The Fifth Ray is the expression of Love/Wisdom through the intellect. This occurs through scientific research and experimentation in order that the Plan of Divinity may be revealed through the mind of man…. It is the purpose of the Higher Mind to penetrate and purify the lower so that humanity may perceive, identify, and know the Mind of God behind all the forms of manifestation. This is the great work of the Fifth Ray. As the sign of Aquarius is on the Fifth Ray and on no other, the scientist and researcher will lead the way into the esoteric realities in our time, and reveal through their work those metaphysical Laws and Principles which underlie the Ancient Wisdom Teachings. [We are moving into the New Aquarian Age, thus the importance of this 5th Ray. LISTEN UP, ALL 5TH RAY PERSONS ] The more evolved of FIFTH RAY-influenced people will, through the scientific method, seek to prove the validity of metaphysical inquiry. The contributions they make to the well-being of society are limitless. Soul Level: Those who work to be connecting links of intelligence between the abstract world of pure ideation and the concrete world of practical application; precision and exactitude in creating those forms and inventions which allow for the outpouring of Higher-Mind Intelligence. Personality Level: Ray of the scientist, technician, lawyer, engineer, researcher, computer expert, and logician. General Character Traits: Power to master a chosen field on expertise; detached observer in quest for truth; accuracy in speech; precise mental perceptions and vision for the application of knowledge; love of scientific inquiry. General Character Difficulties: Lacking in compassion and sympathy; an overly narrow perspective; constant analysis and the splitting of hairs; pedantic; overemphasis on the form aspect of life; materialism; harsh criticism, mental pride, prejudice. If your Sun Sign or Ascendant is Virgo, Sagittarius, or Pisces, you are functioning on the SIXTH RAY OF DEVOTION & IDEALISM. “The Sixth has been the primary Ray of the Piscean Age—[the Age now ending]…. The religious creeds and ideals connected to martyrdom are still influential wherever the Sixth Ray energy predominates…. Terrorism, suicide, and all other urges for self-annihilation based on religious and/or philosophical idealism are very much under the influence of the Sixth Ray…. One finds in its expression those devotional qualities that keep families together, instill great and small philanthropic gestures, and denote such saintly people as Mother Teresa and St. Francis of Assisi…. The Sixth Ray is also the inspiring force of people for whom the principles of Love, Goodness, Purity of Heart, and Selflessness are living energies and form their way of life. Soul Level: The urge to transform selfish and personal motivation into selfless, impersonal devotion for the good of all; the bringing about of circumstances which reorient the exclusive to the inclusive for the greater expression of Love/Wisdom. Personality Level: Ray of the saint, martyr, evangelist/preacher, religious workers of all kinds, psychics, mediums, many kinds of healers, theologians, poets, etc. General Positive Traits: Reverence and devotion; single-mindedness when attached to a cause; courage to fight for beliefs; love, tenderness, loyalty, sincerity, self-sacrifice. General Character Difficulties: Fanaticism; blind devotion; bigotry and prejudice; exclusive attitudes; hero worship; overly dependent on others for emotional support. If your Sun Sign or Ascendant is Aries, Cancer, or Capricorn, you are functioning on the SEVENTH RAY OF CEREMONIAL ORDER & MAGIC. “The Seventh Ray’s main function is to work for the infusion of the energies of spirit with the substance of matter…. It is the working of the Seventh Ray which aids in the fusion of the Soul and the personality, and the resulting reorientation of an individual’s life purpose and direction. It is this process of Soul infusion that can be symbolically rendered by the Seventh Ray alchemist as the process of changing lead into gold. The hope for the Aquarian Age, the Age of the Seventh Ray, is for such a ‘golden’ collective transformation and reorientation to take place for humanity…. The recognition of the esoteric value of crystals in terms of their healing properties has been reawakened from its origin in ancient, magical traditions. One should take note of the fact that the color particularly associated with the Seventh Ray is violet. Of all the many kinds of crystals available at the present time, the amethyst variety seems to be especially popular. The function of the Seventh Ray is to change those forms, both physical and mental, which are no longer of service to the Plan of unfolding evolution of creativity…. The energy behind the New Age is Jupiter, esoteric ruler of Aquarius, and the planet most closely associated with the Second Ray of Love/Wisdom. It is this factor that is the great hope for the future of humanity. Soul Level: The urge to gather, formulate, and harmonize various aspects of a given set of life circumstances into an ordered expression for the Will of God; the urge to make ‘heaven on earth. Personality Level: Ray of the master of ceremonies of any event; film or stage producer; ritualist and shaman; organizational bureaucrat. General Positive Traits: Care in detail, perseverance, strength, and self-reliance; the ability to bring forth order out of chaos; often able to merge the powers of will (Ray One) with cohesiveness (Ray Two) to produce material results (Ray Three). General Character Difficulties: Too rigidly adheres to rules and regulations; may sacrifice self-determination to follow orders set down by superiors; may be very interested in omens and superstitions (especially if the Sixth Ray is also strong); pretentious, formal, follows ceremony mechanically. COMMENT: You may combine a study of your Ray/Rays with a study of your Sun Sign by going to my website: www.pathwaytoascension.com and scrolling down the left hand column of my Home Page to “Your Sun Signs,” then compare these with “Your Destiny Number” based on your name and also listed in the left hand column. We live in an orderly cosmos that knows YOU in great detail. YOU are an integral part of the Whole and your place within the Divine Plan can be filled by no other. The more you get to “KNOW THYSELF” as the cosmos knows you, the more exciting life becomes. COMMENT: The biblical symbolism of 3 Crosses on Golgotha depicts our spiritual journey. Below is a brief description of each of the 3 crosses, taken from Alan Oken’s Soul-Centered Astrology: A Key To Your Expanding Self. COMMENT: The Mutable Cross is represented by the criminal who derided Jesus in Luke23:39. COMMENT: In other words, at this point in our spiritual evolution, we have the privilege of making a freewill choice to ‘sacrifice’ the glorious realms of spirit and incarnate into a physical body for the purpose of serving humanity. COMMENT: The Cardinal Cross is represented by Jesus, who willingly incarnated to serve humanity by showing us the Path of Initiation into Higher Consciousness. Read my article entitled “Ascension” by scrolling down the center of my Home Page at www.pathwaytoascension.com. COMMENT: Each of have lived many lifetimes and are presently living in accordance with one of the three crosses. We can greatly speed up our inner spiritual journey by consciously intending to ascend with planet Earth by 2012. Jesus incarnated to show all of humanity the Way. He did not start a religion nor did he adhere to one. Even though he spoke in the synagogues of his day, there is not one recorded word that he spoke in favor of the religious authorities. Instead, he repeatedly rebuked them. I say this to say that all of humanity ascends in the same way—by mounting the Cardinal Cross—regardless of the religion to which one adheres or does not follow. Archangel Michael, May 1953 – “Then came the seven Elohim, the great Builders of Form, each clothed in robes representative of His office. Then I came with the other six Archangels, and We conferred together upon the creation and sustenance of a solar system. Helios and Vesta showed Us on the Cosmic Screen the planets which They had decided to externalize from Their own Light Bodies, to cradle the members of the seven root races. They had applied to the Central Sun for these which were to evolve into Ascended Beings. Each planet was created for the particular number of lifestreams which had been decided upon by the God-Parents, to give opportunity for evolution upon it. The contour of its surface and the size of the planet corresponds to the particular evolution within the mind of the Father and Mother of the root race. Then We Who represent the protecting power of each successive planet came forth and stayed until the evolution returned in full mastery to the God-Parents. There was the majestic Presence of Virgo, the flaming Presence of Aries, and the serene Presence of Neptune, Who stood before the Elohim and accepted the opportunity and responsibility of drawing the elemental substance from Their own kingdoms into the matrix of Electronic Light formed by the Elohim from the Rays of Their own hearts. Through invocation These three Beings drew around Them Nature Devas, Builders of Form, and small Elementals representing Their kingdoms. The Beings of the various kingdoms accepted the voluntary imprisonment which would be required to make a habitable globe for the new and innocent spirits as well as for the recalcitrant members from the preceding planets of this solar system, but not those of the systems above this. As there were some who were unable to complete their evolution, and it was necessary that they be moved to the next planet when it had coalesced and was ready for habitation. These souls were carried within the Auras of the Archangels and joined with the newly born spiritual egos who were destined for a small number of lifestreams, yet it took upon itself the residue of all the preceding planets of this system, as well as the new egos who were to have the first embodiment in physical form upon it. NOTE: The Love with which all souls are created and cared for by the Divine Beings. Those who choose not to ascend with Earth (Gaia) by 2012 will be carried to another planet that suits the level of their conscious awareness. They will continue to evolve on that planet. Master Jesus, June 1954 – “It was love that caused Helios and Vesta to apply to the heart of creation for opportunity to create a universe. It was love that helped Them to fashion out of Light the beautiful planet. It was love in that great mighty Cosmic Silent Watcher that drew Her voluntarily and made Her to accept the pattern of this universe into Her own living body, willing to remain as long as was required until that pattern could be externalized and every portion and part thereof developed and matured. It was love that drew the Elohim and in Their great and sweet desire to do the Will of God, caused Them to look upon the Divine pattern and then weaving the energies of Their own consecrated lives create the planets of this system. It was love beyond the human mind to conceive that drew mighty Virgo, that drew Neptune, and Aries. They came with a tremendous number of spirits representative of Their kingdoms and perfected the Earth, so beautiful that it was comparable to the Sun, shining and the harmony and the melody of its natural Keynote adding to the Music of the Spheres. NOTE: Contrast the love with which our planet was created with the destruction humankind has mindlessly inflicted upon it. Wake up to Love, folks! Hercules, September 1954 – “They willed to externalize the pattern Helios and Vesta desired (First Ray action)…. Through the Ray of Wisdom They perceived each planet as it was intended, the size, the rivers, mountains, vegetation and atmosphere, and the number of lifestreams which were to come upon it, (Second Ray). Through the Flame of Divine Love (cohesion) They each in turn drew the Light pattern from the bosom of the Silent Watcher. They felt the Love of Orion and desired to cooperate with the God-Parents of this system to bring forth the planet into perfect form. It was Love which enabled Them to accept Their Design, rather than to project Their own, (Third Ray). The Design was being held inviolate by the Flame of Purity of the Eloah of Purity, so that not even a blade of grass would be conceived out of Their minds, but every detail would be manifest according to the Divine Plan (Fourth Ray). Then the radiation of Vista, holding the concentration of energy, and channeling it, called for the Builders of Form, the Angel Devas and the Directors of the Powers of the Elements so that They could coalesce Their energies and talents around one planet at a time, thus serve until it was completed. This concentration was very important so that the planet was ready when the Manu of the first root race and His people who were to embody upon it could come forth. When They created the planets of this system They came rhythmically. It was the power of the Ray of Concentration which drew and coalesced the actual form of the Earth (Fifth Ray). Then Arcturus in rhythm of Invocation and Music perfected every tiny part until it all shone like a diamond, (Seventh Ray). When the creation of the planet was completed it was set into motion by the Eloah of Peace through the Three-fold Flame within His heart, and the Earth began its revolution as the radiation of His Peace flowed forth. The Three-fold Flame began to hum and sing and the planet began to revolve upon its axis (Sixth Ray). The Sun of Even Presence in the center sent forth a radiation producing a soft glow on the surface on the Earth. As there was no decay the vegetation at the end of its season of expression, each manifestation just disappeared. NOTE: There is a Divine Plan for all of creation. We are never left alone to find our way the best we can. Inner guidance is always available to us. The First Ray – The Ray of Will/Power. If your Sun Sign is Aries, Leo, or Capricorn, you are functioning on the First Ray. The Second Ray – The Ray of Love/Wisdom. If your Sun Sign is Gemini, Virgo, or Pisces, you are functioning on the Second Ray. The Third Ray – The Ray of Active Intelligence. If your Sun Sign is Cancer, Libra, or Capricorn, you are functioning on the Third Ray. The Fourth Ray – The Ray of Harmony through Conflict. If your Sun Sign is Taurus, Scorpio, or Sagittarius, you are functioning on the Fourth Ray. The Fifth Ray – The Ray of Concrete Knowledge. If your Sun Sign is Leo, Sagittarius, or Aquarius, you are functioning on the Fifth Ray. The Sixth Ray – The Ray of Devotion & Idealism. If your Sun Sign is Virgo, Sagittarius, or Pisces, you are functioning on the Sixth Ray. The Seventh Ray – The Ray of Ceremonial Order & Magic. If your Sun Sign is Aries, Cancer, or Capricorn, you are functioning on the Seventh Ray. Planet Earth is functioning on the Second Ray of Love/Wisdom. Therefore, as inhabitants of the Earth, each of us function on one or more Rays within the energy of Love/Wisdom. We live and move and have our being within the energy of Love/Wisdom. The Ascended Masters, or Great White Brotherhood, are those Earth human beings who have undergone successfully the Initiation Process and ascended into higher consciousness. The Master Teacher, Jesus, demonstrated this Initiation Process for Earth humans—regardless of religious affiliation. You may find a summary of this process in an article entitled “ASCENSION” found in the center of my home page at www.pathwaytoascension.com (scroll down to it). Some of those Earth humans who ascend choose to remain close to Earth and to assist their brothers/sisters in ascending. This group is called the Great White Brotherhood—having nothing to do with race and everything to do with the White Light of Spirit. The Law of Life & Teachings by Divine Beings offers teachings by the Ascended Masters, many of whom we know as biblical characters now going by their Soul Name. I list the name of the Ascended Master, or other Divine Being, before his/her teachings with the date on which it was given. Lord Maha Chohan, Summer 1956: “There are only two activities in all of life…. There is only the in-breath and the out-breath. There is the magnetization (the in-breath) of the gifts and power of the God Presence, and then Its radiation (the out-breath). Both of these activities take place at Cosmic levels with regard to solar systems, galaxies, and the entire universe. On the out-breath when creation takes place, the Central Sun of a system breathes forth the Suns from within Its own Aura. Each Sun then, in Its turn, breathes out the planets destined to be part of the solar system. This comprises an expression of the out-breath of Deity as regards a galaxy and a solar system. NOTE: All bodies within the cosmos are Living Beings. Lord Lante, August 1953: “When first the Earth became a habitable home, it was required of the Law that the Manu descend into the physical appearance world, carrying with Him the Magnetic Rod of Power, which would be the cohesive force holding the souls destined to embody and evolve into mastery within and on the Earth, and in its Aura. NOTE: Who are we Earth humans? We are spirits who took on a physical body for a while and who walk in the company of our guardian Spirits. NOTE: Goddess Vesta is describing the Ascension through which planet Earth is about to go … Earth will move forward one space. Those Earth humans who are not ready to ascend will be allowed to transfer to another planet vibrating at the 3rd dimensional level and continue their spiritual evolution into ascension there. All unfolds according to freewill choice. NOTE: Great Beings are assigned to help all Earth humans who choose to ascend with planet Earth. Creation takes place through the spoken word (communication), thought, and loving feeling. Archangel Michael: “When a Central Sun takes the Cosmic Initiation to create a galaxy, opportunity to develop and mature is given to three evolutionary intelligences: the mankind, Angelic, and Elemental. The Intelligences inhabiting the Central Sun are known as the Archangels. They possess the full power of the God and Goddess of the galaxy. They radiate the Light that fills the system, forming the atmosphere. In the rhythmic out-breathing of the Central Sun as each lesser Sun is sent forth, seven Archangels and Their Twin Flames go forth to guard all the evolutions of the Sun and its planets. They guard the Sun, the planets, satellites, the seven inner Spheres of the solar system, mankind, the Angelic Beings and the Elementals. The Plan is not for Archangels to embody on a planet, which is meant for another type of evolution. Legions of Angelic Beings came from the Central Sun with Us. Their purpose of being is to fulfill the Divine Plan which is also Our Plan. Besides, We have Angelic Beings Who have and are evolving within this solar system who join Our ranks at times, similar to when human beings make the Ascension. They join the Great White Brotherhood. NOTE: Try to comprehend the Great Love in which Earth humans are cradled. Yet, we Earth humans are millions of years behind in our spiritual evolutionary progress toward perfection. The Master Jesus spoke these words 2000 years ago and still Earth humans appear to have no greater comprehension of His words.